I wish to use this blog to share my stories about working humanely with fearful dogs. The names we use for them does not matter: feral/street/fearful/fractious, they all respond to us in magical ways when we: 1) Look to see who they are and where they are coming from, 2) Watch how we are responding and choose not to add to the conflict in our minds and hearts, and 3) Use the proper techniques and equipment. The goal is not just to provide training material and to create other instructors, it is to strengthen a culture of compassion for all animals and all people. I am committed to teach, learn, and generate discussion about progressive approaches for dog capture and handling. I hope this blog, my YouTube Channel, and website will benefit animal control programs, animal shelters, disaster responders, and trap/neuter/release programs around the world. 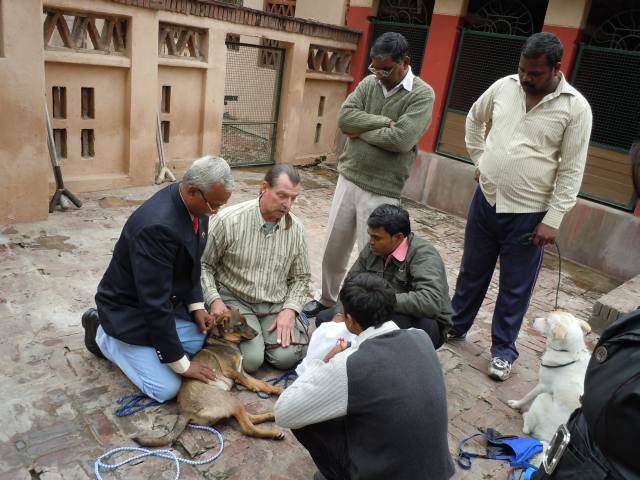 I wish to significantly help with rabies eradication and address dog overpopulation to reduce human and animal suffering. I am producing a variety of training materials on compassionate dog handling in the form of books, e-books, videos, and resources. My goal is to eventually have these training materials reach the smallest animal welfare programs in the most remote parts of the world. Please let me know what you would like to read about or discuss! Here is my contact page. 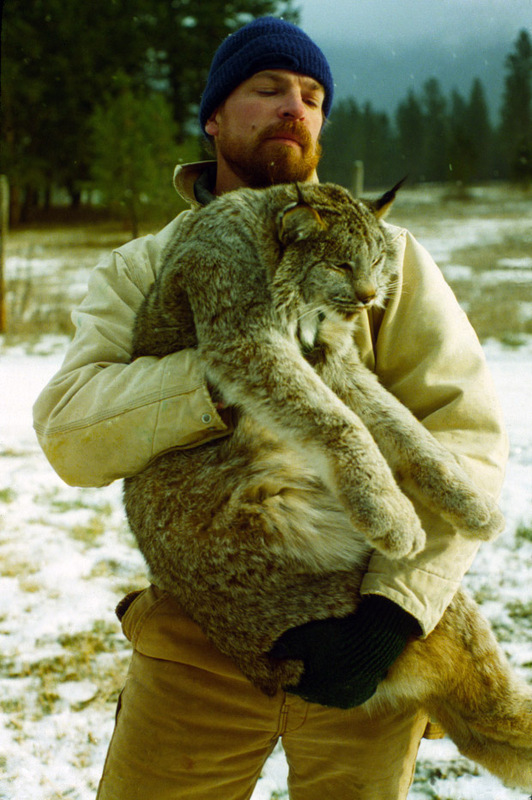 Dr. Mark holding drugged lynx. I am 60 years old (feeling much younger), married to an incredible equine therapist (a healer of horses, dogs, and wildlife), Elizabeth, and living in Hamilton Montana. I have worked with a wide array of wildlife. I have taught rangers in Yosemite National Park how to handle black bears and managers in Glacier National Park how to handle grizzly bears. I have worked in New Mexico to help capture and transport desert and Rocky Mountain bighorn sheep and on tribal lands to gather mule deer and antelope. Other species I have worked with include: fox, coyotes, wolves, mountain lions, bobcat, lynx, raccoons, and badger and others. Each animal I touch is a part of me and teaches me. 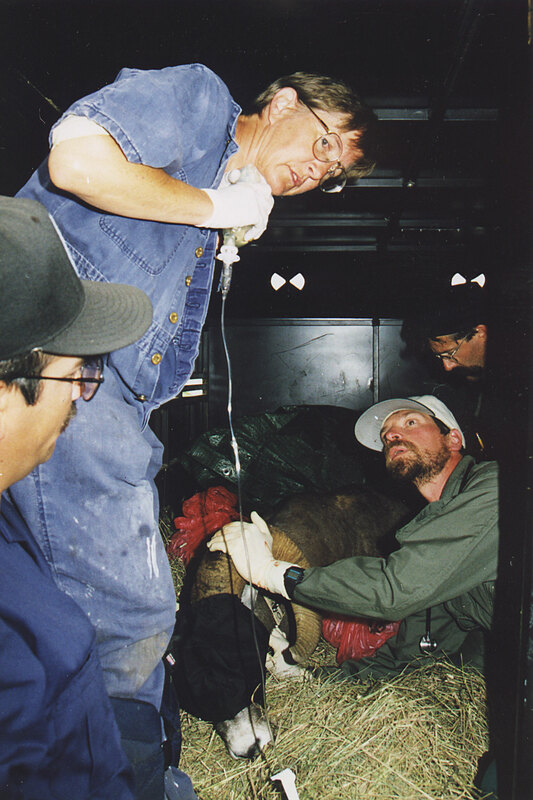 Dr. Mark working with wild wolf. My greatest teacher has been the wolf. 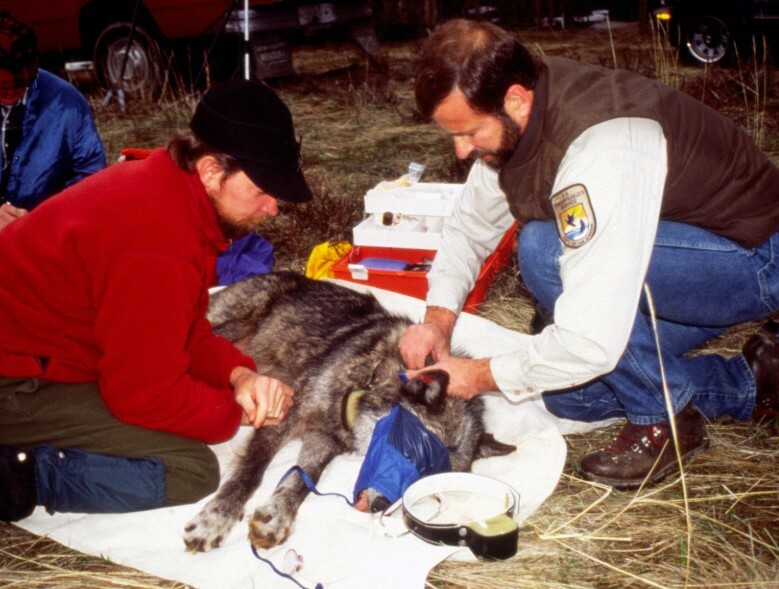 While working as a wildlife veterinarian for Yellowstone National Park, I was Project Veterinarian for the 1995-96 Gray Wolf Reintroduction Program. 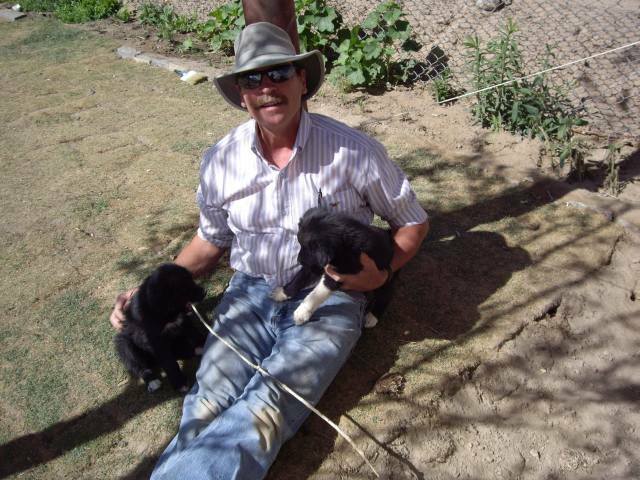 I have handled hundreds of gray, red, and Mexican wolves and they will always be a big part of my life. The knowledge I gained from working with wild and captive wolves has been my foundation for gathering tools and skills for handling the feral dog who is currently my strongest animal teacher. I am very proud about honoring each person I work with and have good relationships with very diverse groups from the Humane Society of the United States to ASPCA to USDA Wildlife Services. My first story is about my trip to Ladakh, India to help a spay/neuter program capture dogs in a manner that is in sync with their Buddhist values, but I have handled over 2,000 feral dogs in the U.S., on Indian reservations, in the Caribbean, in Palau and with rescuing dogs after Hurricane Katrina. Whereever I work, I teach as well as learn. And so this is a wonderful opportunity to share my adventures with colleagues, to learn from each other, and to teach programs around the world how to humanely capture fearful dogs with care, honor, and respect. I welcome your comments to develop this valuable blog and our website. Do you have a protocol for animal control officers in the use of xylazine for feral dogs? My local officers need one to comply with their new departmental regulations. Thank you for your question. Xylazine is an anesthetic and we usually do not drug dogs with xylazine alone. Also in order for me to help, I need to know if you are darting free-ranging dogs or for some other situation. Let’s visit by email and I will be glad to help. Whatever information I provide I will also post on my Feral Dog Library so others will have this information. Thank you. Mark, I took some time today to really look through your blog — great information, wonderful insights, amazing stories and compelling photos. You have been in some ordinary and extra-ordinary situations, but clearly the dogs and their communities have benefitted by your presence, and your willingness to both teach and be taught. Congratulations on good and necessary work. Thanks for your contributions to the field with this new blog. This will be an fantastic complement to your workshops and work in the field. As we’ve worked together to bring several of your workshops to wildlife damage professionals, I have been continually awed by your ability to teach effective field techniques with an attitude of honor and respect for animals. The attitude of honor and respect can be difficult to convey to field wildlife biologists with credibility and clarity, but you’re able to do it every single time. It’s really been a pleasure and honor working with you. Thank you for your kind words. It is always a pleasure working with you. The Esther Honey Foundation has been practicing spay/neuter & release in the Cook Islands for 15 years and conducted the first ever spay-neuter clinic in French Polynesia in partnership with Fenua Animalia. We are confident that our current census, when complete, will confirm that we have sterilized more than 70% percent of the canine population on Rarotonga where we also established and maintain a donations only veterinary clinic. Could you please add our name to S/N & Release programs in the region? Thank you. It is an honor to add your Foundation to our list of TNR programs. Since this blog is to support and help dog TNR programs around the world with information on how to humanely and effectively capture and handle dogs, can you please share with us what your needs and challenges are for learning how to capture and handle dogs? Or can you share with us what methods and equipment are working well for you? We all value your input. WE have a feral purebred Shiba Inu in our Minnesota yard and are very concerned about her well being with winter here. She is making progress in attachmen to ourother pets, but remains beyond arms reach. Over her three months with us she is warm and playful with our pets, walks daily with us and occasionally takes food from my hand. I have been feeding her twice a day, but she will not allow me to touch her. Animal control has come out, we have tried twice to drug her which only seems to make her more paranoid. I have had the Shiba Inu rescue out and they treid to coax her in to no avail. They commented that they have never seen a Shiba so shy and fearful. Our vet has no other suggestions for us to try. Can you offer any other advice. Once these fearful dogs are caught do you have any info about how to work with them to make them adoptable? Please post the web site address to any helpful info. Thanks! This blog its an amazing experience! I´m a Chilean vet, and I have some questions about the Turks and Caicos Project. Did you euthanized healthy dogs? How did the community took that? And did you measure long-term succes of the population control? In my country the law for control dog-overpopulation (a BIG porblem here) is developing, and this kind of data supports better future measures. Until now, euthanize is only permit by a public heatlh problem (rabies ex. ), but massive cooling exists. I would really appreciate data about experiences in succesfull and not succesfull stories of dog overpopulation control. Thanks! Thank you for your comments. I am very glad the Feral Dog Blog is helpful for your work. Please share this with your colleagues. There is another write up about the Turks and Caicos Project on my Field Projects page of my website. Yes we did euthanize healthy dogs. The feral dogs were attacking children, adults, and tourists at the resorts and the government felt that trap-neuter-release was not a solution. I feel one reason that the local community strongly supported us was because we shared and interacted with them so much. My team understood that there were community dogs who played with the children and family and there were feral dogs who had a neutral or negative relationship with people. Virtually no dogs had any collars or sign of ownership. Before we began capturing dogs, I visited every high school and elementary school and was on the radio. We asked if they wanted us to catch the wild dogs and they all said yes, but they did not want their dogs hurt. We passed out 1100 free collars and explained that if we caught a dog with a collar we would neuter it (I use that term for both males and females) and return it to where they were caught. The government paid for all surgeries. Putting collars on was the first step in stewardship. If the dog did not have a collar we were asked to euthanize it. We worked with the local SPCA and also gathered 250 community dogs in three weeks from the families, transported them to the vet, sterilized them, and returned the dog (with a collar) to the families. I would prefer to never euthanize an animal, but I also believe that it should be accepted among the appropriate cultures as another tool. It is not a solution in regions where dog populations are high – Trap/Neuter/Release programs are far more effective for controlling rabies and for decreasing the population. This is because the vaccinated sterile dogs, “block” the transmission of rabies if enough are vaccinated and the sterile dogs put pressure on the non-sterile dogs for food, resources, and habitat. We know that when a population of coyotes, for example, are reduced with hunting the females produce larger litters and have a higher percentage of female pups. Unfortunately, at that time (in 2001) we did not do populations surveys but we should have. I realize now that all programs should conduct methodical population estimates for the populations they are managing. The good news is that the number of euthanasias are down, the number of people bitten is down, and the children and families are very responsible for getting their dogs sterilized and will get a free collar! Now they also put their names and cell phone numbers on the collars. If you would like a current update, contact the Turks and Caicos SPCA. I provide instruction and training on dog capture and handling for programs around the world, but they are always the ones responsible for record keeping so I do not have data on programs which are successful or unsuccessful. Specific programs I have worked for include the Ladakhi Animal Care Society (with Vets Beyond Borders) and projects in Samoa with Animal Balance. These links are on my blog. If you send me an email, I can also send you a published article or two. Great to have found you and this post. Will be monitoring and hopefully contributing something to your posts. We have a major feral dog population and problem here in Hong Kong. The issues that face us face all involved in capture and management – do it humanely, do it cost effectively and efficiently. They are looking for advice on handling a feral dog that is in an animal shelter in Memphis, TN. Thank you for letting me know about their questions and challenges! I have posted a comment and hope it will be helpful. I found your blog and methodologies impressive are they are humane, respectful to the animals and above all, highly effective. I am an active member of Worldvets ( a non profit organization similar to Vets Beyond Borders) in Nicaragua and Ecuador to do TNR to control the feral animal population as well. My experience with them affirmed my desire to work with animals and finalized my commitment to change my career from HR to veterinary medicine. Its still along way as I am only in the process of applying for vet school this upcoming summer 2012. However, I will follow your blog and hope in the future to join and work with you in one of your classes and outreach work particularly I want to specialize in conservation medicine. Your work is truly inspirational and I look forward to gaining more knowledge through your website and blogs. Please keep up the good work because you influence and engage people in great ways more than you know. We are a housing society in Delhi NCR India.we are facing serious stray dog issues and security guards are not able to contain this menace in our gated society.Sir it will be appreciated if you can provide us with a solution. Hello Dr. Johnson! I have been feeding a feral dog for approximately 5 or 6 months now. My heart broke a little when I realized that he was sleeping in an unused canal bank in sub zero temperatures this past winter. I offered him a temporary shelter in the form of a large crate with straw inside and a large tarp over it to keep out the wind and rain. Frankly, all he did was pee on it. He was so fearful that at 100 ft away he would pounce up and down on his front legs and bark at me. After feeding from far away and over time moving the food bowl closer to my house, I was finally able to get him close and to come here for food twice a day. Once the feeding was pretty much down, I put out an older couch cushion in the form of a bed for him by my front door. He has spent occasional nights here ( mostly when there is a storm brewing ) and has sort of accepted my touch in the form of petting. I say sort of, because he is still leary of me. I can not make any fast or noisy movements! My goal is to capture and have him neutered with minimal stress. I have been putting pieces of hot dog ( his favorite) into an open crate to get him used to going in it. He is very smart lol, and always keeps his back feet on the outside! The biggest problem we face, for the moment anyway, is his pack behavior. There is a cul-de-sac behind my house and I believe everyone who lives in there has at least 2 or 3 dogs. We are outside the city limits with no laws pertaining to dogs. They ALL run loose! The feral dog hangs with them for the biggest part of the day, chasing cars and chasing anything that runs, including children! I am going to build a fenced in area to contain if I can hire someone to help me. This dog is beautiful and has potential to be a good pet. I’ve come too far and can’t desert him now! Do you have any advice for me? Thank you for your inquiry. You deserve a lot of credit for helping this dog as long as you have, being patient, and for the huge success you have already made. You have obviously been sensitive and receptive to how the dog wishes to be treated. The fact that he will lay on your porch couch and accept a pet or two and even eat from a crate is a huge accomplishment! If you are willing to build a fence, you might be willing to purchase a box trap which would be cheaper and easier. I suggest purchasing a Tru Catch 48F Folding Dog trap or one that is larger. Be sure to wire the trap open until he freely comes and goes from the trap (which could take weeks). Place it on a porch or around a corner where he will be the most confident to enter it. Cover it with plywood or something so it feels more secure for him. Offer him a variety of foods including smelly cat food at times. Be sure the hot dog pieces or other baits are small enough so he will not choose to carry the pieces out of the cage. Also place some of the pieces underneath the trigger pan. You can see from my box trapping articles here in this Feral Dog Blog that it is best to place the bait under the back left area of the trigger pan. Cover the trap floor with sand or something he is happy to walk on. Since he is already going into a crate, I suggest removing the crate and replacing it with the Tru Catch box trap. But be sure to WIRE IT OPEN for as long as it takes. The pack nature is not a problem for the dog. It is what gives him joy. What will you do after you neuter him? You suggest he could make a good pet but for who? Would he accept being locked up to prevent him from joining the pack? I am glad you wish to neuter him. The best thing after that may be to let him return to his freedom and continue your loving support and attention. Who knows, maybe you can make him a good pet on his terms. Does anyone else have any suggestions or feedback for Julie or myself?